Synopsis: A polymath princess and her faithful musketeer must unravel the plot of a thousand-year-old madman in order to save an a foreign kingdom from a disastrous civil war. Review: I confess that I was really intrigued by the story by reading the summary. 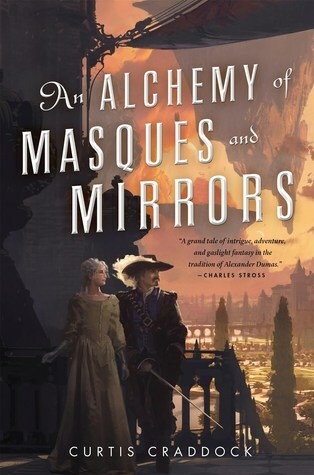 Fantasy and space are often some very delicate subjects for me and I do not venture much into this type of novels, yet An Alchemy of Masques and Mirrors seemed very promising and I’m really happy about it! In this novel we discover the story of Isabelle, a young woman who, because of her lack of magic and the deformity of her hand, finds herself in an excluded position. Fortunately for her, her maid Mary is there to accompany her in all her nonsense and Jean-Claude, the king’s musketeer is always there to save her from bad situations. Her life is a perpetual routine and she hopes that her father will allow her to study science and mathematics secretly and yet … When one day a man from the neighboring kingdom comes to Isabelle to propose a marriage with their heir, she finally sees her exit door. But this new adventure will bring its share of dangers, between assassins, bombs and fires, our heroes will have to face many enemies. I really found this novel fascinating! The author has created an original world that we take pleasure in discovering. Isabelle is an assumed young woman who tries to free herself from her father’s nets, although it is far from simple. She will also attract the attention of the Great King but also of a whole new kingdom that does not want her. She will find herself in an enormous conspiracy of which she seems an important point. Gradually and with the help of Jean-Claude, they will outwit them and understand what is really going on. I admit that the author easily drags us and manipulates us with his characters to reveal us with surprise the truth at the end of the story. Yes, I really had a great time with this novel. The story is really appealing and the characters are all very interesting to discover. A very good discovery for me and I am very curious to see what the author will propose to us afterwards! This entry was posted in Curtis Craddock, Fantasy, The Risen Kingdoms. Bookmark the permalink. Oh hey, this does sound like a good one. I like how the author blended fantasy and sci-fi. I think you had me at musketeer, lol It truly sounds like a good book, fantasy and sci-fi is a powerful mix that fascinates me, so I’ll probably give this one a go! yes it was really interesting. A really good mix! This does sound impressive from the world to the genres. Awesome discovery! Yay for having so much fun with this! Not really my kind of story but glad to hear you liked it. This one is new to me but I do like the sound of it. The world building sounds very well done. Great review! Oooooh. I think I need to add this to my list. 🙂 Thank you! Glad this was so good! I just saw another good review too so that’s two now. Sounds like the worldbuilding and characters are great! Sounds intriguing. The world building appears unique and impressive. Glad you liked this one. Does it? Doesn’t it? Do you know I’m really not sure whether this books appeals or not. On the one hand I think I’d enjoyed the characters and whilst the world building does sound impressive (and I’m definitely intrigued by it) I’m concerned that it might distract from the story.